These lands in central Kansas were specifically managed to overcome drought impacts. Photo courtesy of Chris Tecklenburg, NRCS. Is it over yet? A question often heard being asked during the past two growing seasons. For most of us either directly or indirectly involved with the management of grazing lands, this question seems to occupy our thoughts and minds. As we struggle to make sound decisions during the drought with hopefully a favorable growing season in front of us, keep in mind that these grazing lands have endured drought before and most likely will again. The decisions we make prior to, during, and in the recovery period of a drought do and will have lasting impacts. The current drought can cause stress to both the land and its manager. While we have limited control over the weather, we do have total control of our decisions and actions. Stress can be escalated when we fail to choose in advance actions to take when the climate provides less than we hope for. So where does a person start? One of the best initial actions you as a manager can take is to make sure a forage inventory, animal inventory, and grazing plan is in place for the land you operate. The plan should include realistic goals which address the direction of your management and a hope of what your land will be in the future. If you haven’t completed these items, this is the first step to take in better understanding your land and its capabilities. Next, ask yourself, “What can I do now, as a manager, to address the current climatic impact or an impact which inevitably is in our future?” Walk through the three steps below. 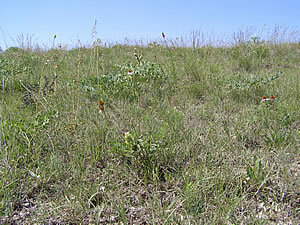 Evaluate the condition of the rangeland in comparison to what is desired for it to be. Are production, species composition, and vigor, still positive? Is grazing management and goals such as wildlife habitat in balance? Have a sound understanding of the desirable plants which are present and what their needs are. Quick answers to those questions will most likely lead you to realize that you may or may not need to make adjustments in your management. We as managers tend to treat the symptom rather than the cause. For example, we are likely to address undesirable plant species, commonly referred to as weeds, by spraying the entire plant community rather than the management that allowed for their presence. In doing so, we remove many native plants which are positive contributors to the plant community as a whole. Finally, ask yourself, “What are some positive actions I can take to address present concerns?” Some items to consider are listed below. Take a close look at stocking rates and amount of vegetation being removed through the course of the growing season. Increase rest or recovery from grazing for plants during the growing season. Identify actions that relieve stress to plant communities and can be implemented at the onset of drought or continuation of drought. Actions may include destocking, early weaning, culling lower importance animals within the herd, etc. Gain a better understanding of what average rainfall is for the area you manage and how the precipitation received affects forage production and plant response. Focus on decisions directed towards long-term sustainability and improvement rather than short-sighted goals. Presently, ranchers across the Great Plains have developed and are implementing drought plans. Most are hoping for improved conditions, but realize that we live in a location susceptible to drought and are always one good rain away from possibility. For more information or help developing a grazing management plan, contact David Kraft, State Rangeland Management Specialist for the Kansas Natural Resources Conservation Service, at 620-343-7276, ext. 105, or david.kraft@ks.usda.gov.